TEHRAN, Aug. 27 (MNA) – The head of Iran’s Atomic Energy Organization has said Iran has improved its centrifuge capability to 24 SWU (Separative Work Unit). 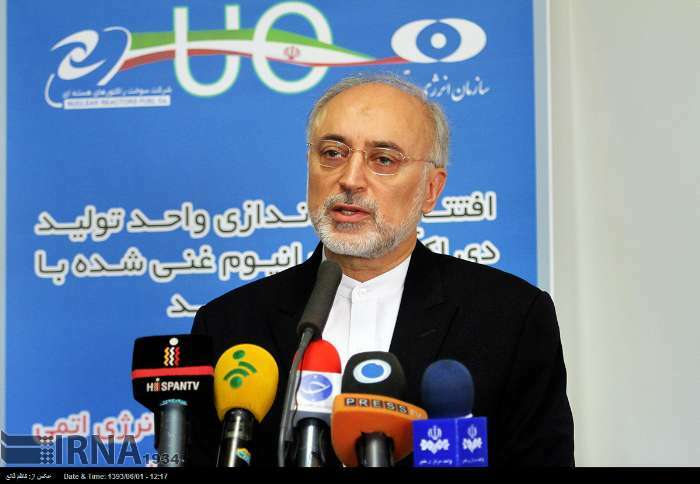 “The Organization staff in Arak is now restructuring the heavy water complex, and we had a meeting yesterday in foreign ministry to address the issue,” Salehi told TV program. About construction of a nuclear hospital, Salehi said that the preliminary actions had been launched for building the hospital; “the project needs heavy financing and a proper situation,” he added. Salehi maintained that good feasibility studies had been conducted on cutting-edge radiation technological facilities such as cyber-knife used for robotic radio-surgery, and radiotherapy as the latest cancer treatment method. In response to a question whether these centrifuges would not be violation of Geneva deal with the 5+1, Salehi said that it was Iran’s rights. “The Joint Plan of Action sets no limit to research and development and we introduced IR8 centrifuge in the framework of Joint Plan of Action where each centrifuge was 24 SWUs,” added the head of Atomic Energy Organization.